Week 6 is in the books for the American Athletic Conference and the teams within the conference fit into three categories: They are looking to establish an identity, others are trying to maintain momentum from good starts and a few are determining if this season is already a wrap and it’s time to start focusing on recruiting. Temple is off to its best start since 1974 as it defeated Tulane 49-10 to remain undefeated. As with most Owls performances, the team stat line isn’t overly impressive — only 345 total yards — but they managed to get the job done. PJ Walker passed for 183 yards on 11-of-15 yards and star running back Jahad Thomas only had 54 yards on 14 carries. The defense did a great job dictating the pace of the game as it only allowed 110 total yards and eight first-downs. Sophomore defensive back Sean Chandler helped the defense get into the scoring column with a 22 yard interception return for a touchdown in the third quarter. In somewhat of a shocker the Huskies travelled to Orlando to face UCF and basically embarrassed them on their home field with the 40-13 blowout win. The Huskies offense had a balance attack as quarterback Bryant Shirreffs passed for 256 yards and Arkeel Newsome rushed for 84 yards on 13 carries. The UConn defense did a great job of taking advantage of the poor UCF offense and forced four turnovers on the afternoon. The sophomore cornerback duo of Jhavon Williams and Jamar Summers had interceptions for a second consecutive week and is starting to become an irritant for opposing quarterbacks. This is why you play the games. After struggling against tougher competition the USF Bulls came out and played its best game of the season in the 45-24 win over Syracuse. Head coach Willie Taggart had been looking for a signature win in his first three seasons in Tampa, and this was it. 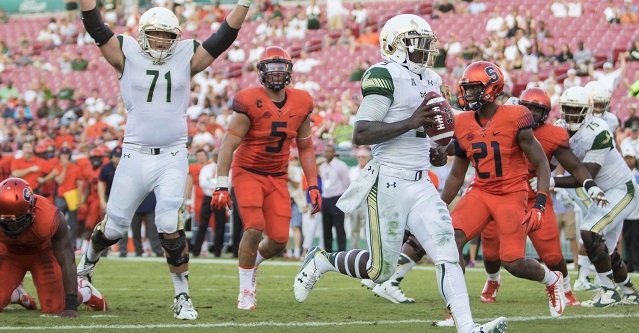 Quinton Flowers looked like a legitimate quarterback as he passed for career-high 259 yards and two touchdowns. Marlon Mack continued his stellar play this season with a 184 yard and two touchdown performance. The Bulls showed the ability to fight through adversity as Syracuse got within seven points midway through the third quarter, but the 45 yard touchdown run by Mack closed the door on the comeback. I do not know what’s going on in Orlando, but this does not seem like the championship caliber program from the past few years. Instability from the quarterback position and a leaky defense led to a surprising 40-13 loss to UConn on Saturday. Justin Holman returned as starting quarterback but he wasn’t any better than the other guys they had been shuffling in and out of the position as he only completed 54% for 255 yards and was intercepted three times. With the dismissal of running back William Stanback from the team last month, the Knights have been struggling to establish any type of run game. Maybe the performance of C.J. Jones, 44 yards on only seven carries, is a sign of something the offense can build upon. The Cougars toyed with in-state rivals SMU for one half of football as the score was 28-21, but then team realized how much better it was and went into overdrive and finished off the struggling Mustangs in a 49-28 blowout. Greg Ward Jr. passed for 244 yards but surprisingly zero passing touchdowns. But what he didn’t get into the endzone via his arm he did with his legs as he rushed for 82 yards and had four touchdowns. Running back Kenneth Farrow also proved to be too much to handle near the endzone as he scored on three of his nine carries. Three forced fumbles allowed the Cougar defense to negate any momentum SMU was trying to generate in the first half. Linebacker Steven Taylor led the charge with eight tackles, four tackles-for-loss and three sacks. Quarterback Keenan Reynolds only completed 2-of-4 passes for 16 yards and never was able to give the team that dual threat option it needed as Navy loss to Notre Dame 41-24. Despite being one-dimensional the Midshipmen still were able to run for 318 total yards — 110 of that by Reynolds. Fullback Quentin Ezell had two touchdowns to go along with 75 yards on six carries, but the Navy defense was not able to slow down the Fighting Irish offense enough to pull off the upset as it allowed 459 total yards. The growing pains of changing a culture continued in the 49-28 loss to Houston on Thursday. The statline for the Mustangs doesn’t look bad; 399 total yards 9-of-16 on third-down conversions and 21 first downs. But it was turnovers, three costly fumbles, that did the team in. Outside of taking five sacks Matt Davis looked good as he passed for 248 yards and three touchdowns. With teams now focusing on go-to receiver Cortland Sutton (six catches for 48 yards) Davis was forced to find a new target and that was Darius Joseph (2 catches for 63 yards.) If the SMU defense could learn to defend a running quarterback better, this team could turn around quicker. When you are facing one of the better teams in the conference it would help to put up more than 110 total yards if you plan on pulling off the upset. Unfortunately that’s all Tulane could muster in the 49-10 loss to Temple. Nothing went right offensively: two turnovers, 2-of-15 third-down conversions and four sacks allowed. Consistently under pressure quarterback Tanner Lee passed for a measly 95 yards — with his longest pass going for 13 yards. The rush offense was not much better as Teddy Veal led the way with 34 yards on eight carries. As a team, the Green Wave rushed for -2 yards thanks in part to the 43 yards loss due to sacks. Quinton Flowers Quarterback USF: Known more as a runner than a passer, Flowers performance in the upset victory of Syracuse went a long way in showing that what Coach Taggart has been building could be successful. This was also the first game in which he did not throw an interception, so that is a great sign for the sophomore quarterback as well.